Gerry Hadden is an author and journalist who began his public radio career in 1995 at public radio KPLU in Seattle. In 2000 NPR sent him to Los Angeles. Later that year, he went to Mexico City. From 2000 to 2004, he served as NPR's Mexico, Central America and Caribbean correspondent and covered presidential elections in Mexico, Guatemala, Haiti and Nicaragua. He reported extensively on immigration, drug trafficking and the varied cultures and characters of Latin America. He also traveled frequently to Cuba where he reported on U.S.-Cuba relations, the economy and the arts, as well as on daily life under Fidel Castro. Four years after watching Jean Bertrande Aristide be sworn in as Haiti's first democratically elected president, Hadden in 2004 covered Aristide's flight from power amidst an armed rebellion. That same year, Hadden moved with his family back to Spain, his second home. From Barcelona, he covers Spain and Europe for "The World," although his stories have taken him as far as Cape Verde, Istanbul and Kiev. He says that besides driving a taxi in New York, reporting for public radio is the most interesting job he's ever had. When he's not reporting he spends time with his partner, Anne, and their two children, Lula and Nino. 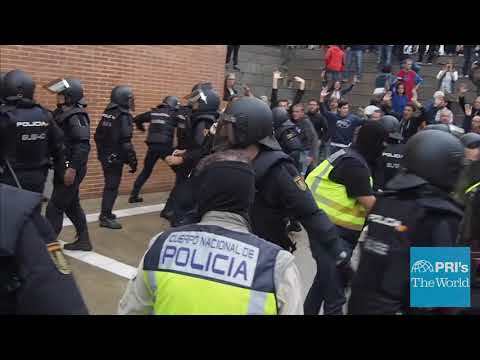 Journalist Gerry Hadden offers a firsthand look, from a Barcelona polling center, at Spanish police's violent operations to disrupt the outlawed referendum on Catalan independence. Gerry Hadden grew up in the US, but moved abroad to report. He's built a family in Spain — and now struggles to explain mass shootings to his kids. A brand-new ambulance service in Haiti, the country's first, is working remarkably well. But it's a lonely moment of progress in the country's slow rebuilding process, and the rest of the health care system is still lagging behind. It would seem that not much has changed in the 10 years since I was last in Haiti. But I found not just that Haiti has changed — but it has become another country altogether. Brazil is one of the most dangerous places in the world to be an activist, according to a report by Global Witness. In the past ten years, hundreds of environmental activists who have spoken out against pollution and overuse of Brazil's natural resources have been attacked or killed. For the past eight years, an international ban has protected Brazil's forests from being cleared to grow soybeans. But that ban expires in December, and some people in Brazil fear that soy farmers are coming soon for their forests. In France, government-funded agencies help people save their loved ones from so-called cults. But that list includes groups like the Jehovah's Witnesses and, not too long ago, Baptists. Some of them are now fighting back in courts. We’ve been hearing a lot about anger in Brazil leading up to the World Cup, which kicks off this Thursday. People have been protesting over everything from bus fare hikes to the billions spent on the country’s 12 soccer stadiums. The unrest has caught mainstream media off balance. In part because of Midia Ninjas.They call themselves citizen journalists: volunteers covering the social unrest with their smartphones.